Whoever enters the Convent of the Flagellation today will notice a new name on some doors: SBF Archaelogical Collections. 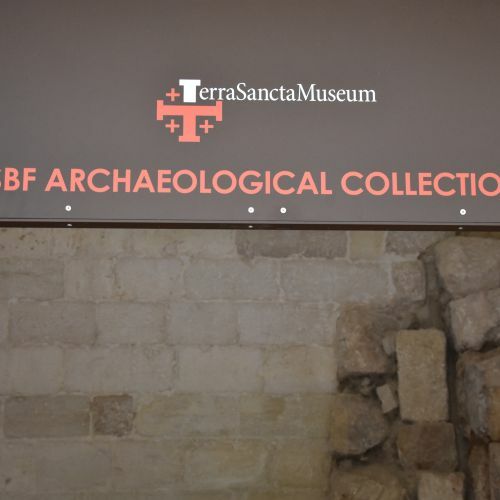 This will be the name of the new section of the Terra Sancta Museum which, with its name, is linked to the long tradition of the Franciscan archaeologists of the Studium Biblicum Franciscanum which preserve the precious excavation finds linked to the Holy Places. 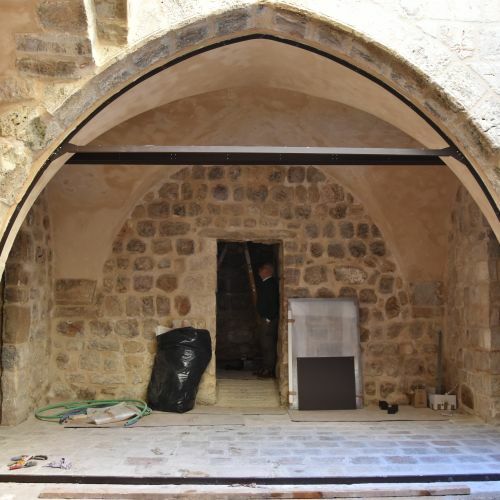 While the works for the opening of this new museum section continue, supported by ATS pro Terra Sancta, the first phase of the preparation of the rooms was completed in recent weeks. «The architectural design of some areas has been provided – explains the architect Vincenzo Zuppardo (volunteer of ATS pro Terra Sancta) -. All the assembled elements, from the external doors, to the fixtures, false ceilings, catwalks on cisterns, are in “powder-coated” metal according to the design and taste of the chief architect Tortelli ». The works were carried out by the Lamp Arredo Tailored Metal company, an Italian company also involved in several several other works in other museums (Bergamo, Milan, Cremona, Verona, etc.) and able to work the metal and glass from the architectural structure to the piece of design. So for two weeks the workers of the Italian company and the local workers of the Custody of the Holy Land worked together in a completely synergistic way. 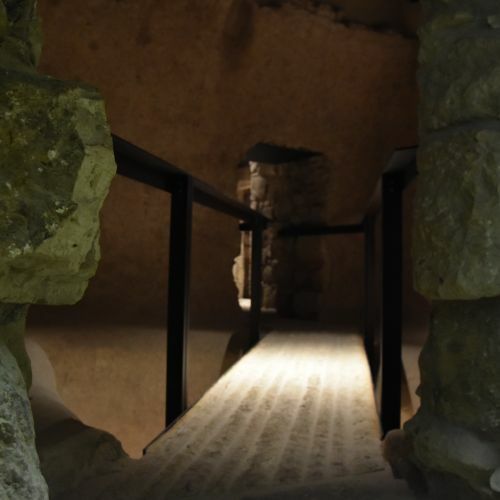 Entering the ancient rooms in stone, the first room of the archaeological museum was completed, which will serve as an introduction to a part dedicated to Herod. 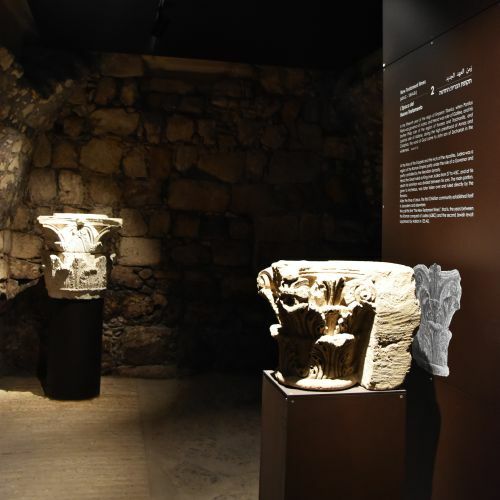 Two splendid capitals coming from Herodion and from the Tomb of the Herodes adorn the hall and a panel illustrating the historical context of Palestine in the time of Jesus. 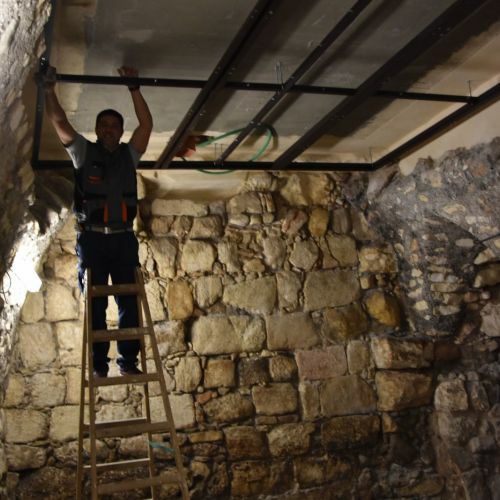 In addition, while cleaning an ancient cistern, in the area traditionally called “house of Herod”, a masonry cross was discovered. “No one knew it and does not even appear in the studies of Father Bellarmino Bagatti – explains Fr. Eugenio Alliata (professor of archeology at the Studium Biblicum Franciscanum and director of the Terra Sancta Museum) -. The curiosity arose when one of our workers during the cleaning work told us that he saw a cross “. So the Franciscan scholar, together with the chief architect of the Tortelli shipyard and the young architect Zuppardo, has descended into the cistern 5 meters deep c.ca, for a reconnaissance. “If all the hypotheses of dating are open – concludes the Franciscan friar – certainly the discovery of a cross shows the presence of Christians in that area probably between the fourteenth and sixteenth century. In June 2017, in the same environment had been found two large slabs dating back to the Roman age (1st-2nd century AD), mosaics and a large column, made of red Bethlehem stone, perhaps of the Byzantine age, used under the pavement as a covering of a cistern. In the second phase of preparation, we will provide the windows and supports of objects. 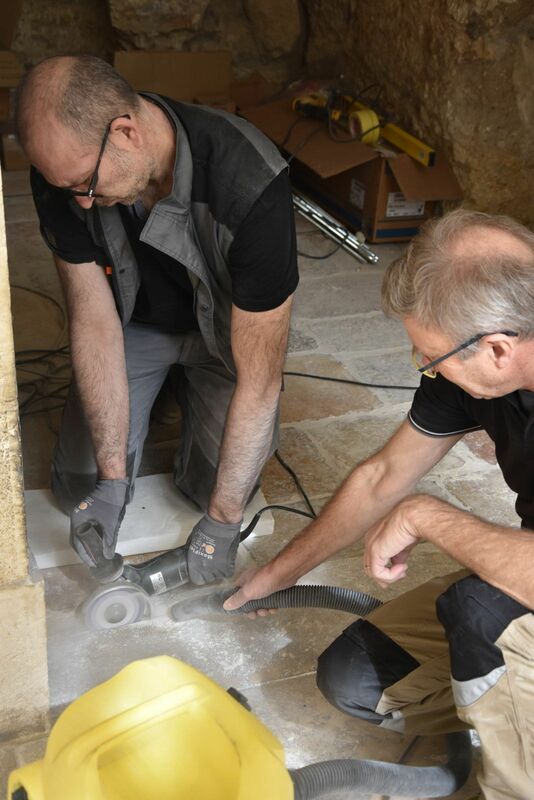 The bases of the windows will be in local stone like the one that will be placed on the floor with the names of those who contributed and will help to support the great project of the Terra Sancta Museum. 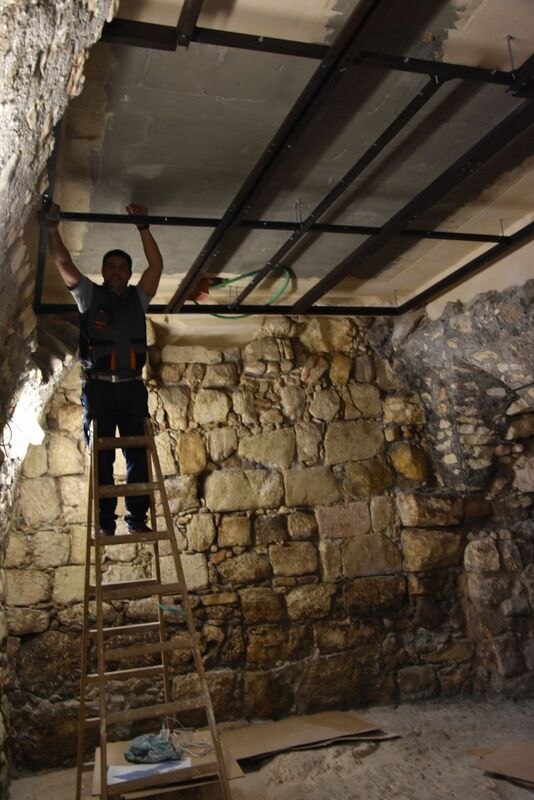 While it’s working the ancient rooms reveal new pieces of the Christian history of an area, yet to be discovered and rebuilt, we are waiting for the next opening the 27 June!